Amy moved away a few years ago across the country. I miss her something terrible. She contacted me saying she's going to be swinging through New England for a week in October. I wanted to hear her play live music to me. So I suggested a House Concert here at the studio, to close out the 2014 series of "Bring-Your-Own-Chair" concerts. She excitedly said YES! 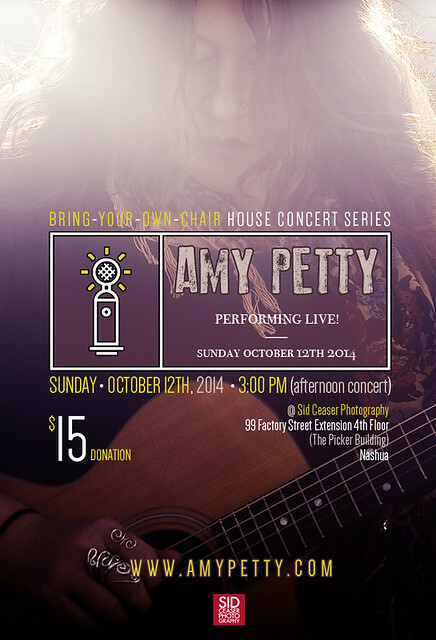 So she's going to be performing here at the studio on Sunday, October 12th 2014 at 3pm in the afternoon. It's Colombus Day weekend. You all should be available. Especially in the afternoon. $15 donation at the door. Then come and buy some of her cds. Listen to her amazing voice, her amazing songwriting, her amazing EVERYTHING. I want the studio packed. I want to send her home with a wallet full of cash and a bunch of new friends. Because she's just that damn good.